Axiom Design Resource LTD, are experts in designing and building unique retail environment spaces for client such as Rolling Stone, Pandora & New Era. 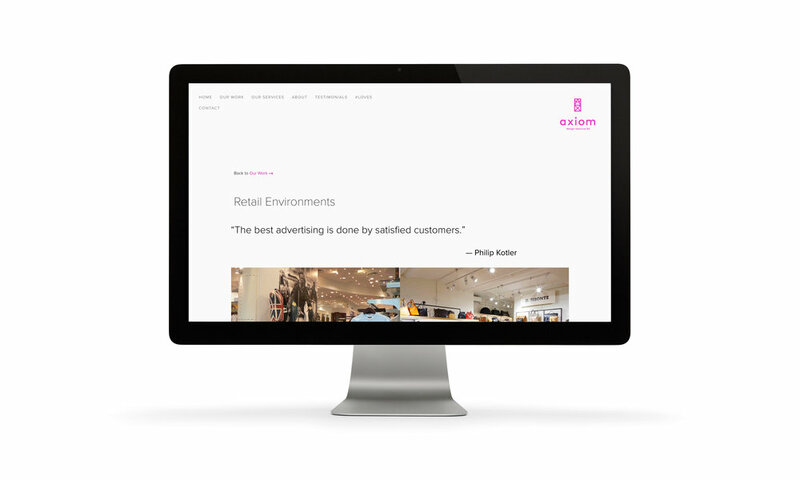 We were commissioned by Axiom to design and develop their brand identity and website environment. We worked closely with them to explore, adapt and evolve their brand positioning. From this, we created and designed a new brand identity that represented them, allowing their vibrant personalities and vibrancy to shine through. The design was crafted to be versatile, bold and playful - utilising colour, illustration, texture and a bold tone-of-voice to capture their consumers attention and stand out within their marketplace. This was then developed into a creative website environment, where users would instantly recognise the brands persona, and easily navigate through their projects and refined content.